That filling is mouthwatering and am sure it made a wonderful snack! That is a very interesting recipe. The spinach tomato cheese is a super ultimate combo..the flavours gel so well and you have done such a amazing job. Truly fusion with the use of tortilla in place of pastry dough. Quick tasty snack. Looks like a great snack for kids. This tortilla version must be guilt free than the pastry one. 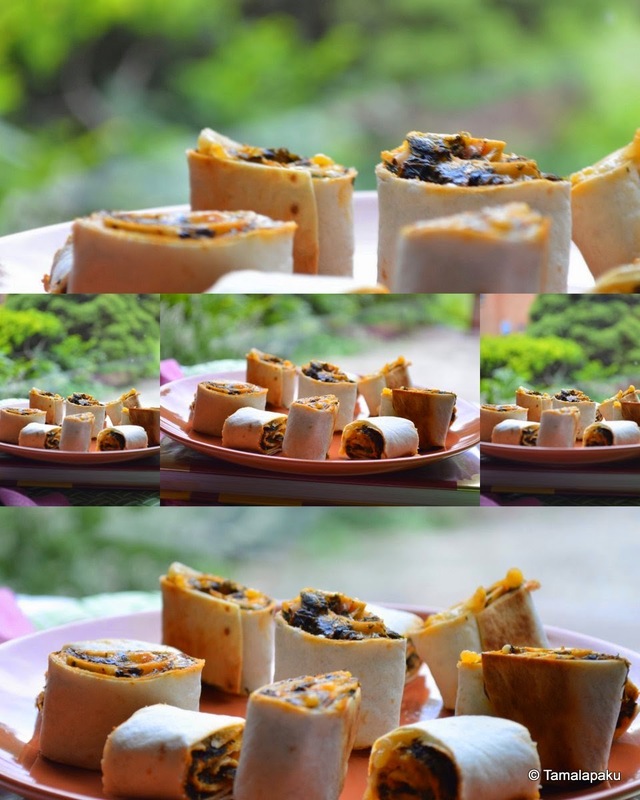 wow such an flavorful tortilla boreks :) looks so tempting very healthy snack time roll ups..
Pictures are amazing Harini..very nice recipe too.. Such a beautiful finger food,i can have few anything, sounds like a healthy snacks for kids. This is delicious Now it will be tiffin box special.. I've tasted Turkish boreks many times. Your version with flour tortillas sound so quick and easy. These bite sized pieces look quite addictive.. These bite size rolls are very inviting. Tempting. I am sure my kids will love these.They look very addictive indeed. Tortillas looks so tempting and pictures are wonderful.